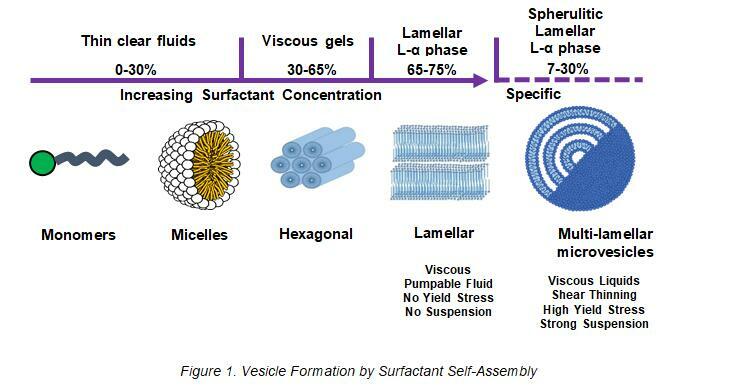 Surfactants in the bulk aqueous phase self-assemble into various aggregate forms, such as lamellar, hexagonal or multi-lamellar vesicles (figure 1).1 This phenomenon is largely driven by the surfactant concentration and chemistry. These various phases impart unique physical properties to the surfactant solution, particularly at high concentrations where shear-thinning suspensive systems can be obtained. First appearing more than 30 years ago, examples harnessing the self-assembly of surfactants are numerous across many disciplines. In 1985, multi-lamellar vesicles were used in laundry liquid to suspend sodium tripolyphosphate crystals, allowing higher loading of the builder than previously attainable.2,3 Although these systems can be employed by using high surfactant loadings, it was discovered that various additives, such as salts or oils, can force the conformation of surfactants into multi-lamellar vesicles at much lower concentrations. While additives improve practicality and cost by reducing the surfactant load, they limit the scope of formulations where this technology can be used. 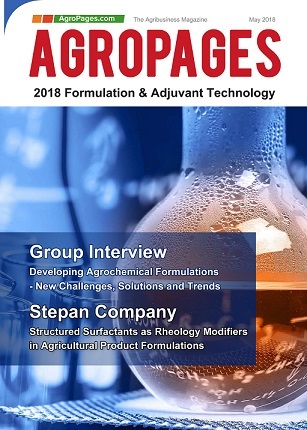 Herein, Stepan Company presents a novel method for preparing suspensive systems by using a combination of high and low HLB surfactants, thereby eliminating the need for additional additives. We apply this technology to agrochemicals, allowing us to develop formulations not achievable through conventional methods. An optimized ratio of a low HLB surfactant to high HLB surfactant, in the presence of water, forms vesicles that measure approximately 100 nanometers in size, resulting in a translucent liquid.4 These packed vesicles create a thick fluid with high yield stress, capable of suspending a range of materials, from solid pesticides to oil adjuvants. These fluids are also shear-thinning, non-thixotropic and have high elasticity. The conventional rheology aids found in agricultural formulations have many limitations. For example, some pesticide actives are incompatible with xanthan gum and fail to solvate regardless of how much or how long shear was applied. Xanthan gum and other rheology aids can also present incompatibilities when electrolytes are built into a formulation concentrate or when diluted into liquid fertilizers. Additionally, low pH systems can cause issues with xanthan gum, even when an acid-stable grade is used. To evaluate a structured surfactant system in low pH, a carbaryl suspension concentrate (SC) was developed and evaluated for stability against xanthan gum controls at varying pH levels. 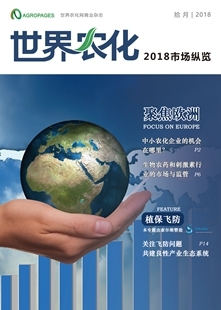 All samples containing xanthan gum showed significant separation and hard packing, while the structured surfactant formulations remained stable at an elevated temperature. To identify the optimum ratio of low HLB to high HLB surfactant, the formulation liquids are first evaluated without any component suspended. Several samples should be prepared varying the ratio of surfactants and visually inspected for stability. High shear energy is not necessary to incorporate the structured surfactants, unlike with xanthan gum and other rheology aids. After some mixing, air would have been incorporated, and the presence of suspended air bubbles over time gives an early indication of the suspensive system. Promising samples are then placed for temperature stability testing at 54°C and for freeze thaw evaluations at -15°C. An example of sample preparation with ratios and stability observations can be seen in figure 2. 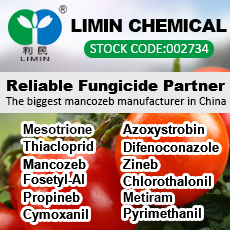 Once a ratio is identified for a structured system, the formulation can be prepared with solid pesticide particles or the liquid oil adjuvant suspended. With a suspended component, small adjustments to the HLB ratio may be necessary for an optimized formulation. 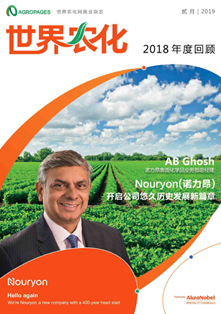 The type of surfactant chosen for the low and high HLB structurants can also be selected to perform more than one function, such as a dispersant or wetting agent, for example. To determine if a strong suspensive system was developed, we can characterize the rheological profile of the formulation. 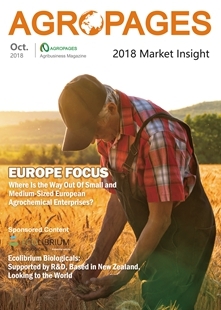 A four-pound per gallon atrazine SC was developed with structured surfactant technology and evaluated against a control formulation containing xanthan gum. An oscillation stress sweep of these two formulations reveals a more robust system and stronger structure at rest. Additional rheological methods were performed on the structured surfactant system, including a thixotropic loop, to show rapid recovery of the internal structure and temperature ramp to illustrate similar viscosities over a range of temperatures, compared to xanthan gum control. Formulations can also be structured in the presence of electrolytes. It is important to start evaluating HLB ratios with the electrolyte present at the targeted level to determine which ratio will work best. A combination potassium and isopropylamine (KIPA) glyphosate salt was structured and evaluated for stability without any additional component suspended. That same structured formulation was then used to suspend atrazine particles for a combination KIPA glyphosate and atrazine formulation. The structured glyphosate-atrazine formulation showed superior dilution performance, compared to a generic KIPA glyphosate formulation tank mixed with a generic atrazine SC at the same active levels. 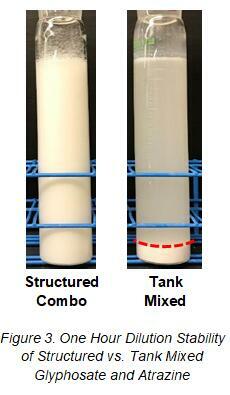 The tank mixed material flocculated immediately upon dilution and after one hour had 7.5% separation, while the structured combination dilution had trace levels of cream sedimentation (figure 3). 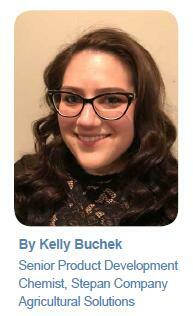 An oil adjuvant can also be suspended through structured surfactant technology. Similar to structured KIPA glyphosate with suspended atrazine, rapeseed oil was suspended in KIPA glyphosate. When a generic rapeseed oil crop oil concentrate and a generic KIPA glyphosate formulation were combined without structured technology, the formulations separated, demonstrating that additional surfactant would be necessary or the materials would require tank mixing instead. In addition, both oil and pesticide particles can be suspended together in one formulation concentrate, as seen in the rapeseed oil and suspended atrazine combination that was developed. 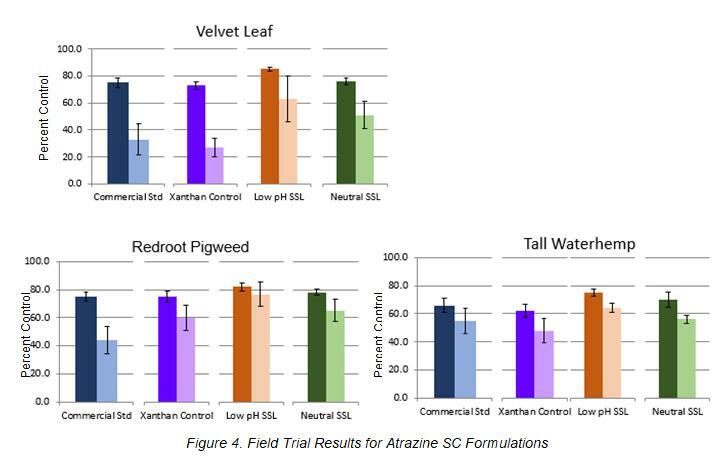 Stepan conducted field trials with two different structured Atrazine SC formulations, a neutral pH and low pH chassis, along with a commercial standard and xanthan control formulation. The results showed similar or improved performance in three weed varieties, using a 10-ounce per acre use rate, while comparing seven days of control against 28 days of control (figure 4). 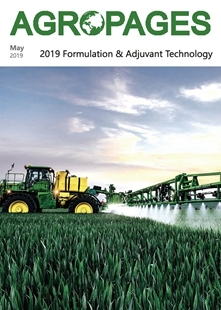 The future work with structured surfactants will continue to focus on unique combination formulations and identification of advantages over existing conventional technology. 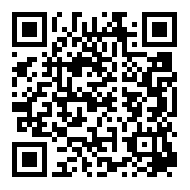 The information contained herein is based on the manufacturer’s own study and the works of others and is subject to change without prior notice. The information is not intended to be all-inclusive, including as to the manner and conditions of use, handling, storage or disposal or other factors that may involve additional legal, environmental, safety or performance considerations. Nothing contained herein grants or extends a license, express or implied, in connection with any patents issued or pending of the manufacturer or others, or shall be construed as a recommendation to infringe any patents. STEPAN COMPANY MAKES NO PRODUCT WARRANTY OF MERCHANTABILITY OR OF FITNESS FOR A PARTICULAR USE, EXPRESS OR IMPLIED, AND NO OTHER WARRANTY OR GUARANTY, EXPRESS OR IMPLIED, IS MADE, INCLUDING AS TO THE INFORMATION REGARDING PERFORMANCE, SAFETY, SUITABILITY, STABILITY, ACCURACY, COMPLETENESS OR ADEQUACY. Stepan Company (and its employees, subsidiaries and affiliates) shall not be liable (regardless of fault) to the vendee, its employees, or any other party for any direct, indirect, special or consequential damages arising out of or in connection with the accuracy, completeness, adequacy, furnishing, use, or reliance upon information provided herein. The vendee assumes and releases Stepan Company (and its employees, subsidiaries and affiliates) from all liability, whether in tort, contract or otherwise to the fullest extent possible under the relevant law.